No matter where you travel in Cambodia, the past is always present. History, both ancient and modern, is everywhere here; whether you’re cycling in the shadows of the mighty Angkor Wat, wandering the streets of cosmopolitan Phnom Penh, or exploring the Mekong in search of river dolphins, or trekking in Mondulkiri or relax on the beach in south of Cambodia, you can’t escape the pull of time that shaped – and continues to shape – this arresting land. For more information about this 2 weeks adventure, please contact our travel consultant today. Price from: $1300 - Book now! Welcome to Siem Reap, the provincial capital and gateway to the ancient Angkor Temples. Recognized as a World Heritage Site by UNESCO, the Angkor Archaeological Park encompasses dozens of temple ruins including Bayon, Banteay Srei and the legendary Angkor Wat. Upon arrival, you will be met and driven to the hotel for check-in. Spend the rest of time at your leisure. Accommodations: Hotel in Siem Reap. Rise up early to pick up the most beautiful, haunting and spiritual moment to visit magnificent Angkor Wat at dawn. This special activity is designed also to help you see “the Temple reflex on the water” when it’s much cooler and less crowded. Angkor Wat, the UNESCO World Heritage Site, which was constructed by Suryavarman II who reigned Cambodia from 1113 to 1152 and built the five towers in the 12th century and dedicated them to the Hindu God Vishnu. The plan of the pyramidal conception of the temple combined with spaces, alleys and ditches is an ancient masterpiece of architectural design and construction. For your most convenience, a table with hot tea or coffee and breakfast box arranged by Travel Cambodia will be served right on site of Angkor Wat. Our journey continues with a visit to the South Gate of Angkor Thom, with its majestic doors and artifacts. Then we visit to monumental temple of Bayon which is the heart of Angkor Thom. Later, go to the Elephant Terrace, Terrace of the Leper King and Takeo "Jewel of Crystal", which is dedicated to the Hindu God Shiva and was erected at the end of the 10th century. Leaving Angkor Thom by the North Gate, you travel to Preah Khan (Sacred Sword), one of Angkor’s largest temples, constructed in the 12th century by Jayavarman VII. You should not miss Ta Prohm Temple, which is a wonderful combination of human genius and natural beauty with its giant trees that have grown there for centuries. Return to the hotel and spend the rest of time at your leisure. Meals: Breakfast box, tea, coffee. Day 3 Kbal Spean - Banteay Srei. Breakfast at hotel then transfer to Kbal Spean which was the refuge of 11th – 13th century religious hermits and over the centuries they carved lingas stands, animals and sacral friezes into the surrounding rocks and riverbeds. Today, a well-marked path leads up the forested hillside to the central area that contains most of the carvings. The walk takes about 45 minutes. In addition to the carvings there is also a variety of fauna at Kbal Spean and the trees and rock pools attract a colorful array of butterflies. After lunch drive to Banteay Srei, “Citadel of the Woman”, which is home to some of the finest examples of classical Khmer art. Next, explore Banteay Samre. On the way back to town, you will watch the sunset in Pre Rup, considered as Mini Angkor Wat. Return to town in the late afternoon, you are free to explore the PsarChass, also known as the “Old Market” for shopping. After having breakfast at hotel, you will be picked up and transferred to the Angkor Temple Complex where one of the experiences Sky Rangers will guide you through the treetops, soar ziplines and traverse suspended sky bridges. In the afternoon, embark on a boat trip on Tonlé Sap Lake, Southeast Asia’s largest freshwater lake. Board a local boat and visit Kampong Phluk, a village where houses are built on stilts to combat the rainy season on the lake (a time when Tonle Sap swells to four times its size.) (Note: Due to low water levels during the dry season, the boat trip is only possible from June to March. An alternative floating village at Chong Kneas can be arranged instead). 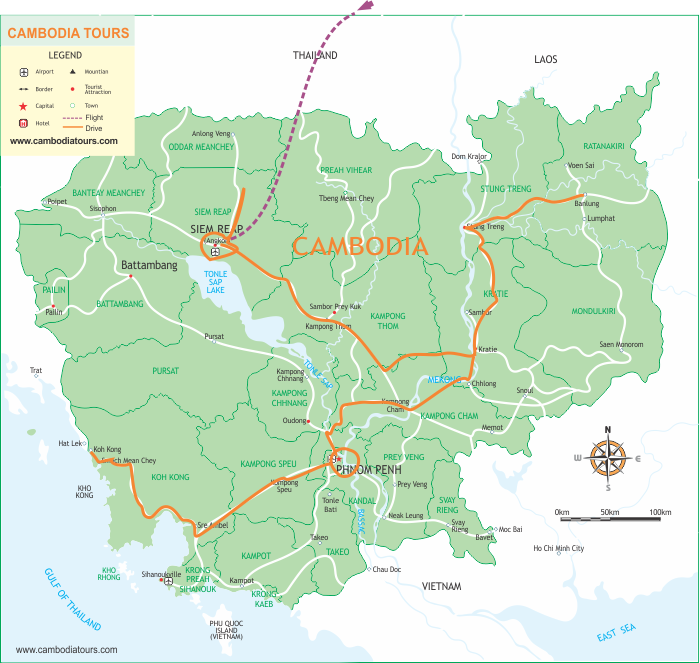 Enjoy breakfast at your hotel then set out on a 2 hour drive to Kampong Thom (147km), home to Cambodia’s most impressive group of pre-Angkorian monuments. Here you will visit the ancient temple complex, Sambor Prei Kuk, situated just north of Kampong Thom. The main temples are divided into three complexes, all dedicated to Shiva. Enjoy the serene atmosphere as you wander through these 7th century brick monuments, artfully scattered about the jungle. Return to the town of Kampong Thom in the afternoon and check in at hotel. You will be free on your own afterward. Breakfast at hotel followed by a travel to Kratie, a vibrant riverside town and home to the endangered freshwater Irrawaddy dolphins. On the way, visit the Cham Ka Lour rubber plantation, before crossing the Mekong River by ferry at Stung Trong/Krochmar district of Kampong Cham province. Arrive in Kratie in the afternoon and check-in at your hotel. Then drive north of town and take a local boat to view the freshwater dolphins that inhabit this stretch of the Mekong. Enjoy an hour on the river, before returning to the quaint French colonial town for the evening. Today we travel to Cambodia’s eastern province, Mondulkiri. With rolling grassy hills, pine growths and rainforests, this sparsely populated province is unlike anywhere else in Cambodia. Mondulkiri is also home to the majority of country’s tribal minorities, including the Cham and Phnong peoples. Arrive in Sen Monorom, the region’s capital, in the late afternoon. Check in at the Mondulkiri Hotel and enjoy the evening discovering this small, quirky town - the base from which to explore the surroundings hill tribe villages and cascading waterfalls. After breakfast at hotel, our guide will take you to Mondulkiri elephant sanctuary. 8.45am – 9.00am: drive to the starting point of the tour which offers views over the large area of forest which has been protected from logging by the Mondulkiri Project. 9.00am-12.00pm: First we walk from the hilltop into the jungle to the Mondulkiri Project’s Jungle Lodge. Here you will listen to your guide talk about the Mondulkiri Project. Next it is time to meet the elephants and their Mahouts. Take lots of photos, get close to the elephants and have fun feeding the elephants bananas. Watch as the elephants walk around eating bamboo and enjoying being elephants. You will also see them scratching against tree trunks and throwing dirt or mud on their backs. 12.00pm – 2.00pm: After walking back to the Jungle Lodge it is time for lunch and relaxing in hammocks. The Lodge has great views over the jungle and is a good place to view wildlife and many species of birds. 2.00pm – 4.00pm: In the afternoon we return to the bottom of the valley to find the elephants still eating lunch. Next we help the mahout slowly walk an elephant to the washing area alongside a lovely waterfall. It is time to have fun swimming and washing one of the elephants in the river to keep its skin clean and healthy and free from infection. Elephants really enjoy having a bath! We then walk to another deeper waterhole where we watch an elephant playing in the mud and washing swimming. 4.00pm – 5.00pm: After saying goodbye to the elephants we walk back out of the jungle to our starting point before being driven back to your hotel. Wake early and visit the local market frequented by the Phnong people, traveling from the nearby villages to buy and sell their wares. Then we travel to Bou Sra about 40 km northeast from Sen Monorom. This double drop waterfall is one of the largest and most impressive in all of Cambodia. Enjoy the natural beauty of the region then discover the Phnong village also named Bou Sra. On the way back to Mondulkiri we will stop at a numbers of hill tribe villages, taking time to appreciate the countryside and scenery. Say good bye to Mondulkiri and continue on the tour to Kampong Cham, where we will stop to visit the Wat Nokor Pagoda. This 11th century Mahayana Buddhist shrine is home to a large reclining Buddha as well as many carved Buddha images. In the afternoon we continue on to Cambodia’s capital, Phnom Penh. Upon arrival, check in at the hotel then enjoy the rest of the evening at your leisure. Phnom Penh was founded in the 14th century and has long been a vital trading hub at the confluence of three rivers: the Mekong, Tonle and Bassac. Start the day on a guided tour of the Tuol Sleng Genocide Museum and the notorious Choeung Ek “Killing Fields” to learn about the Khmer Rouge and Cambodia’s recent history. In the afternoon, try out your best bargaining skills on a walk through the city’s expansive “Russian Market”, where you can find anything from motorcycle parts to valuable gems. Our cultural tour continues as we visit the National Museum an excellent introduction into ancient Khmer art and civilization and the Royal Palace, home to the royal family and the opulent silver pagoda. Breakfast at hotel and then take a long drive Koh Kong which is the most southwestern province of Cambodia. The journey offers an excellent opportunity to observe Cambodian rural life up-close. Upon arrival, board a boat to Four Rivers Floating Lodge. Enjoy the rest of time at your leisure. Accommodation: Four Rivers Floating Lodge. Free at your leisure or you can take part in tours such as Tatai Waterfall, Eco adventure tour, safari world and lots of water sports. This morning, we drive back to Phnom Penh airport to catch your departure flight home. We sent you an email for detail information. Please check it and let us know your feedback as soon as possible. For the suitable time to travel to Cambodia without a lot of tourists, I recommend you to come in low season (from end of March to September). But the best months with nice weather (not humid) should be in March and April. For the itinerary: Please be informed that we just organize private tours so the itineraries are very flexible. You will have a private helpful knowledgeable English speaking tour guide & an experienced driver to accompany your group through the trip. did you receive my questions as screen went blank?